Lean Thinking: Time to Boycott the NFL (Part 3)? Time to Boycott the NFL (Part 3)? Our NFL blogs seem to have struck a chord. Thanks, all, for your thoughtful feedback. I was especially struck by my friend Fletcher Groves’ insights into the difference between golf and NFL football. Golf, Fletch pointed out, teaches the difference between right & wrong, self-control and respect for others. We sent Matthew, our nine-year old to golf camp this summer. “What did you learn?” I asked. “I learned about etiquette, Dad” he replied, with charming pronunciation. He went on to explain what the word meant & why it was important. It’s striking that professional golfers are expected to police themselves, and take pride in the fact. 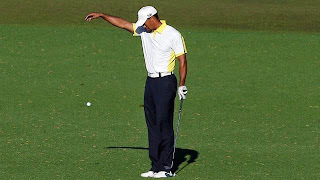 The overwhelmingly negative response to Tiger Woods’ dodgy ball drop at the 2013 Masters is a case in point. ‘Should Woods have been disqualified?’ continues to be a hotly debated question. Woods himself acknowledged that perhaps he got the rule wrong, and seemed genuinely contrite. Let me also add that he took a costly two-stroke penalty. The point is that professional golfers accept and even revere the rules. Golf standards for amateurs, like Yours Truly, are not as stringent of course. Truth be told, I have been known to use the ‘toe wedge’ to get my ball out of comical lies. And my frequent forays into the club parking lot or adjacent highway do not always trigger proportionate penalties. But then again, I don’t record my scores (so as to avoid embarrassment) or play for money. Golf has detractors and challenges of its own, which I know the PGA is working on. But integrity isn’t one of them.